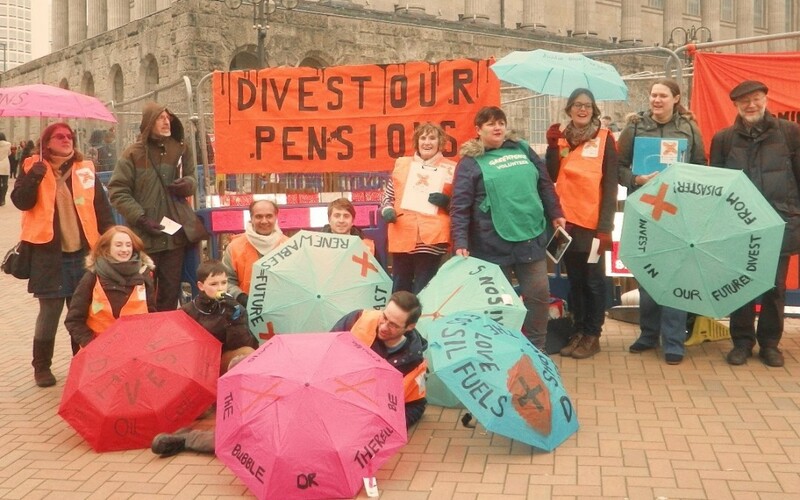 On Saturday 13th of February, environmental campaigners from across the conurbation came together for this year’s first Divest West Midlands Pension Fund day of action. 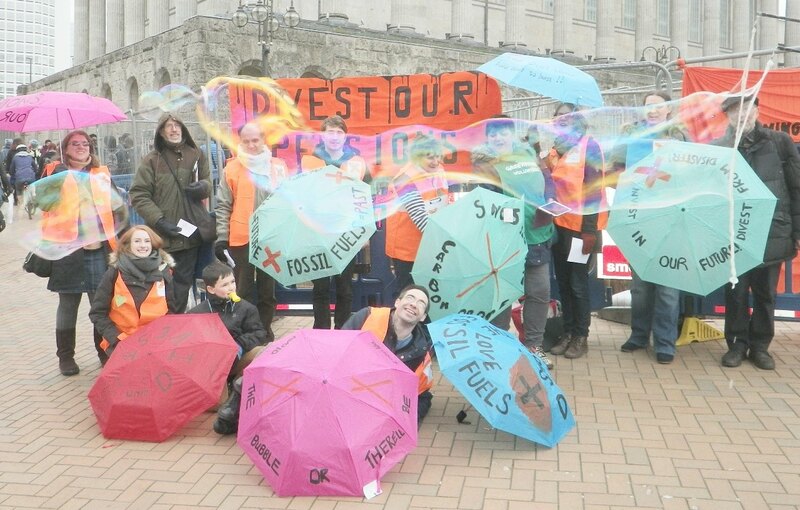 Dressed in orange high visibility jackets and brandishing umbrellas covered with divestment messages, the group were a splash of much needed colour on a grey afternoon in Victoria Square. The aim of the day was to gather petition signatures and share information about the significance of fossil fuel divestment as a local issue in Birmingham. The DivestWMPF campaign is calling on the West Midlands Pension Fund to divest from fossil fuel industries and reinvest in a way which supports climate justice and the possibility a fossil free future. This means freezing all new investments in fossil fuels and divesting those that already exist. The WMPF is investing over £145 per resident in fossil fuels. Money is invested into multinational fossil fuel companies including over £58 million in Shell and and £43 million in BP. These investments are totally irresponsible both economically and environmentally. Fossil fuel companies are highly overvalued due to the assumption that all of their reserves will be burnt. However it is public knowledge that 80% of current fossil fuel reserves must stay in the ground to avoid catastrophic climate change that will exceed the 1.5 degree pledge made in Paris. This overvaluation means that there is a multi-trillion dollar ‘carbon bubble’ that is ready to burst. Playing on this, campaigners on Saturday blew giant bubbles across the square and let passing shoppers have a go themselves. This was a great conversation starter and campaigners were delighted by the amount of interest that was shown. The day was in conjuction with the Climate Coalition’s ‘For the Love of’ action, which is asking the public to wear a green heart this Febuary for anything they love that is threatened by climate change. Campaigners wore green hearts to show their love for a pension fund that is free from ties with fossil fuels. Campaigners who took part on Saturday included members from Birmingham Friends of the Earth, Greenpeace, the Green Party and Climate Action Network West Midlands. It was a fantastic rally of support for the campaign with over 100 petition signatures collected over the course of the day.